I have written in previous posts about how I like to always carry a few survival items on my person. Unless you are trying to board an airplane or go into a government building, it is no trouble to add a pocket-knife and a cigarette lighter to the other items in your pocket or purse. I go a little farther than that by carrying a little card with some fish-hooks, fishing line, and snare wire in my wallet. All of these items would be very useful in a survival situation. There is one more item that most people include in survival kits, but that they usually don’t carry with them on a daily basis. That item is some form of cordage. Other than shoe laces (if you happen to wear lace-up shoes), most people don’t carry cordage around with them. Let’s face it, people would probably avoid you on the subway if you walked on with a fifty foot roll of para-cord hanging from your belt. But, there is a way that you can carry some cordage with you and not look like too much of a weirdo. 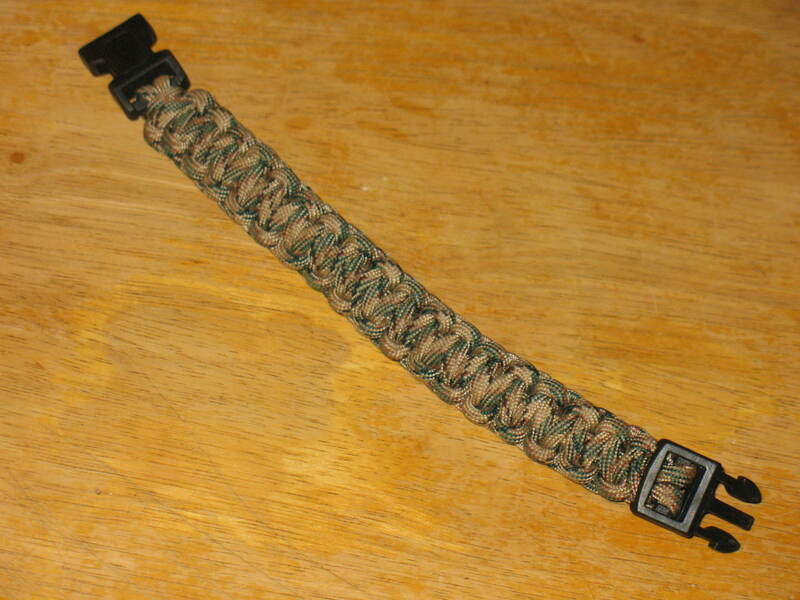 You can wear a survival bracelet. When you unravel the knots you will have about eight feet of good cordage to use as is, or you can slip the woven outer sheath off of the para-cord and you will have 7 eight foot long pieces of 50 pound test nylon twine that can be used for making snares and other items. 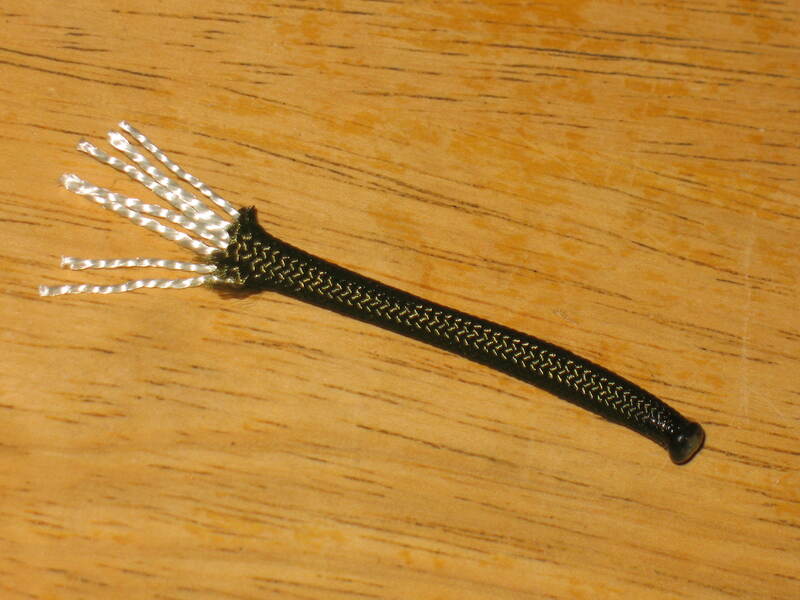 Pictured below: Para-cord with sheath pulled back to reveal strands of nylon twine. Not bad; over 50 feet of cordage worn around your wrist. You can do an inter-net search for “make a cobra bracelet” and you will find several sites with instructions on how to make them, or you can buy them ready made. You can buy them off of the inter-net or you can pick them up at gun shows, craft stores, arts and crafts fairs and many other places. Prices range from $4.00 to $10.00 US. The cheapest ones I’ve found are at a craft store called Hobby Lobby where they sell for $4.00 US. That’s almost cheaper than you can buy the materials to make one. 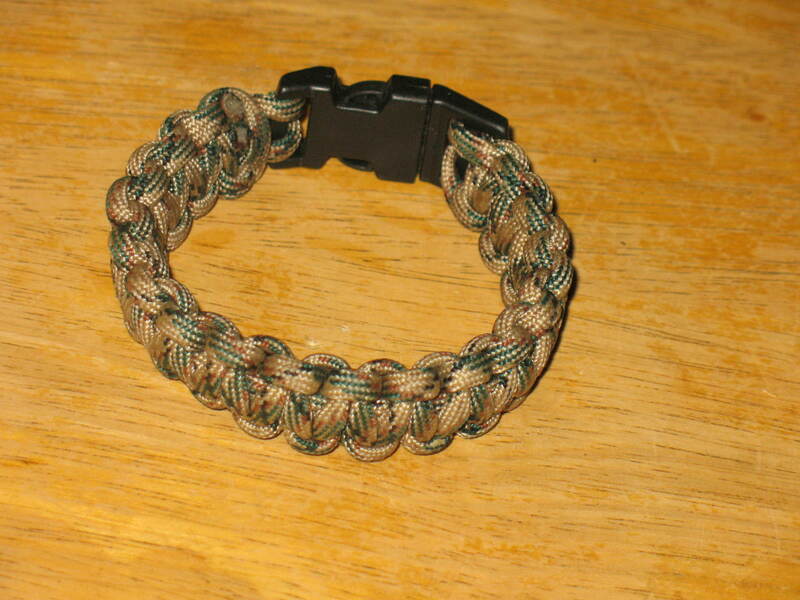 In my next post, I am going to show you how to make a compact, multi-purpose survival bracelet that will let you carry fire-starting tinder, snare wire, fishing line, and multi-purpose cordage all in one neat package that snaps around your wrist.